Let's start things off by going through some IDP news, notes, and commentary from Week 12 of the NFL season. Both Robert Quinn and Chris Long laid goose eggs in a great matchup against the Cardinals who were giving up roughly 4.5 sacks per game to opposing defenses coming into the week. D.J. Williams continued to rotate with Danny Trevathan in passing situations. Wesley Woodyard remained an every down linebacker beast. The Packers rotated Erik Walden with Frank Zombo. Surprisingly, Dezman Moses played every down. Erin Henderson and Jasper Brinkley rotated again in the first half of last week's game. Henderson became an every-down player after Brinkley's shoulder sprain. With Brinkley questionable for this week's game, Henderson could be an every down linebacker for Week 13. Jason Babin was released by the Eagles after a severely disappointing season in which he had only 5.5 sacks after putting up 30.5 sacks combined in the previous two seasons. Look for Brandon Graham and rookie Vinny Curry to see increased playing time. Casey Hayward managed to muster only 1 assist against the Giants on MNF last week. The Packers decided to match up the taller Davon House on Hakeem Nicks which left Hayward in the slot where he saw only 22 snaps. Colin McCarthy had another stinker of a game and although he has a great matchup this week against the Texans, he hasn't shown he's a top 30 LB this season. 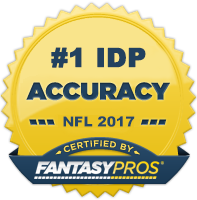 Now onto The Guru's IDP waiver wire selections for Week 13! LDT Fletcher Cox (PHI) - As the Eagles plummet further and further down the standings, Cox has seen his playing time increase and he's quickly emerged as one of the better rookie interior defensive linemen in the league. He faces a Cowboys team this week that really struggles with interior pass protection and he may have have one of his best games of the year. He is injured and did not practice Wednesday, but said there's a chance he could play this week. Make sure to keep a close eye on his injury status. LDE Brian Robison (MIN) - Robison failed to come through for owners last week in a great matchup against the Bears. He gets a chance to redeem himself this week against a Packers team that has allowed the 4th most points to defensive linemen this season. Robison usually gets sacks in bunches at sporadic points during the season. This could very well be one of those sporadic ooints. RDT Phil Taylor (CLE) - Taylor registered his 1st sack of the season last week after missing the first 8 weeks due to injury. He finally seems to be getting near full health and his numbers should only improve as the season winds down. He has a fairly advantageous remaining schedule and could serve as a DT2+ option in DT-required leagues. RDE Bruce Irvin (SEA) - Irvin was considered by many draft pundits to be one of the biggest reaches of the 2012 draft. However, he's been a steady producer in the sack department this season with seven and has a good chance at hitting double digits before the year is over. He only has a total of 11 tackles on the season however and therefore should only be utilized in big play leagues this week. Expect a sack or possibly two against the Bears turnstile offensive line. ILBs Dan Connor/Ernie Sims (DAL) - With Bruce Carter done for the season with an elbow injury, veterans Dan Connor and Ernie Sims will man the inside of the defense. If last week was any indication, Conner will leave the field in dime packages with Sims staying as the lone linebacker. Not sure if this will hold true for future weeks, but there's a good chance one of these two linebackers emerges as a viable LB option in moderate to deep leagues. Pick up both if you have bench space in deep leagues. If you have to pick one, I'd go with Sims for now. RILB Demorrio Williams (SD) - Due to an injury to Donald Butler in last week's game against the Ravens, Williams was inserted into the base package and managed to post 10 total tackles (9 solo) in basically a half of football. According to Pro Football Focus, he managed a tackle on a ridiculous 25% of the team's snaps. Although it's highly unlikely he continues to produce at that efficient of a level, he's worth a grab as a streaming LB3 option this week even though he may only still play in base packages. RILB Jameel McClain (BAL) - McClain has been a solid LB3 option for us the past three weeks. In that time span, he's posted 26 total tackles. Dannell Ellerbe is currently nursing an ankle injury and may not play this week. If he can't go, bump up McClain a few spots in your rankings. WLB Zach Brown (TEN) - After being criticized earlier in the year for his tendency to avoid contact, Brown has taken his recently given every down role and made the most of it. He's been outproducing all other Titan linebackers over the last couple weeks in fantasy points and has a great matchup this week against a Texans team that loves to control the ball. Brown is a LB3+ this week and likely for the rest of the season. RCB Drayton Florence (DET) - This is purely a matchup play suggestion. Florence will have the task of defending the Colts receiving core this week and stopping Andrew Luck. The Colts have been the #1 matchup for DBs this season and I expect Florence to get picked on quite a bit by the rookie Luck. SS Corey Lynch (SD) - Lynch will be taking over the starting strong safety position now that Atari Bigby has been placed on IR. He had 10 total tackles (8 solos) after coming into last week's game and should the bulk of the snaps for at least the next couple weeks. He's a decent desperation DB3/4 play in moderate to deeper leagues. LCB Robert McClain (ATL) - McClain has posted 5 or more tackles and a pass deflection in four of his last five games. He draws a nice matchup this week against the Saints who you can bet will be airing it out a ton to keep up with the Falcons vaunted offense. He's a good bet for 5-7 solos this week. LCB Keenan Lewis (PIT) - Lewis has had three solid fantasy games in a row and is typically a good bet for a pass deflection or two (he has 18 on the season). The Steelers play the Ravens this week, a team Lewis registered 8 solos, 2 assists, and 2 PDs against just two weeks ago.